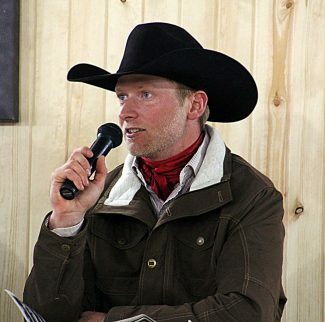 Brice Carmichael had the honors of making the opening comments for the 50th Annual Carmichael Herefords bull sale. 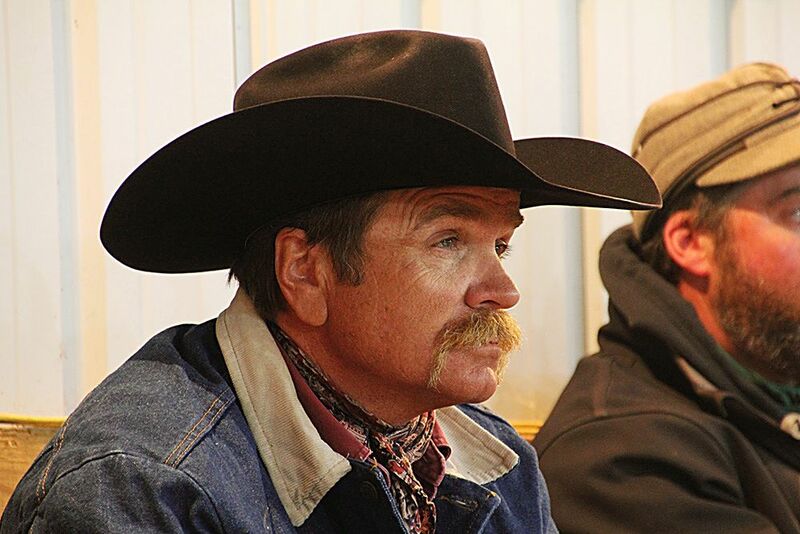 Todd Mortenson, Hayes, SD, many times repeat Carmichael Herefords customer. 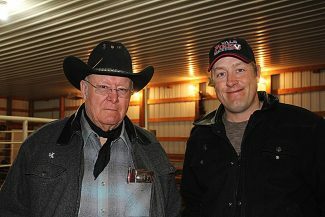 Davis Ranch, Tom and Jim Davis, Belle Fourche, SD. Faithful Carmichael Herefords bull buyers. The weather finally cooperated for Carmichael Herefords to hold their 50th Annual Bull Sale. After having to postpone twice because of weather, the third try finally worked, giving the Carmichaels a great beautiful sunny day for the sale. With a lot of road conditions still compromised, the crowd was maybe lighter than past years, but the bulls were in great sale shape and sold quite well. Lot 13, KC L1 Domino 18065, a 3/18 son of CL 1 Domino 420B 1ET with epds of BW 0.9 WW 59 YW 93 Milk 22 selling to LeRoy Scott, Highmore, SD for $6,000. Lot 17, KC L1 Domino 18082, a 4/18 son of CL 1 Domino 420B 1ET with epds of BW 3.7 WW 57 YW 90 MIlk 22 to Mortenson Cattle Co., Hayes, SD for $6,000. Lot 7, KC Mr. Freckles 18039, a 3/18 son of KC Mr. Freckles 16059 with epds of BW 4.9 WW 63 YW 96 Milk 29 selling to Tonya Lawhead, Lodgepole, SD for $5,500. Lot 45, KC L1 Domino 17049, a 3/17 son of B&D L1 Baron 4273, with epds of BW 4.1 WW 65 YW 101 Milk 34 selling to Todd Gerbracht, Meadow, SD for $8,500. Lot 28, KC L1 Domino 17011, a 3/17 son of HH Advance 2008Z with epds of BW 3.8 WW 58 YW 92 Milk 28 to Larry Dolezel, Belvidere, SD for $8,000. Lot 31, KC L1 Domino 17026, a 3/17 son of B&D L1 Baron 4273 to Kennedy Ranch, Faith, SD. Lot 44, KC L1 Domino 17038, a 3/17 son of HH Advance 2008Z to Davis Ranch, Belle Fourche, SD. Lot 63, KC L1 Domino 17088, a 4/17 son of B&D L1 Baron 4273 to Niederman Ranch, Morristown, SD.